Amelia 2015 was an anniversary for RM Sotheby’s, a year since the strategic partnership between them debuted at this auction. After a highly successful first year RM Sotheby’s Amelia Island auction was a successful start to the second year. The total sale was down significantly from last year’s blockbuster result but 2015 was a hard act to follow and the $38.7 million total in 2016 continues the trend of earlier years. In fact, by any measure other that last year in all except the sale rate the 2016 Amelia Island numbers were healthy. Strength was spread throughout collecting areas. Just among the nine million dollar lots there were two late model supercars, a Ferrari 288 GTO and nearly brand new Pagani Huayra and two classics, a ’32 Packard Twin Six and lovely ’31 Stutz DV-31 Convertible Victoria, balancing Ferraris, Bentley and Cobra from the ‘50s and ‘60’s. Outstanding transactions included the 1954 Bentley R-Type Continental Fastback. Estimated at $1.2-1.4 million it hammered sold at $1,650,000, a quarter million dollars over its high estimate. And not to be overlooked (which isn’t hard since it was no bigger than a gnat’s splat) was the Peel P50, a sub-microcar not much bigger than a motel room fridge, that was estimated at $75-100,000 and sold on a hammer bid of $160,000. There is no doubt, however, that prices are being adjusted and there is less willingness among buyers to splurge on something that suits their fancy on the spur of the moment, something that also is being seen in the art market. RM appears to have adjusted its estimates, and often the expectations of its consignors, with some success to reflect the evolving market. There was one sad note. Max Girardo wasn’t on the auction block for RM, his father having died just days before the sale. Eli Rodriguez from Sotheby’s stepped in on short notice and did his homework. He looked like Max (right down to the 5 o’clock shadow) and sounded like Max although without the accent or seamless transition among languages. Our most best wishes go out to Max. Andrew Newton contributed many of the on-site observations; the editor remains responsible for the final content and comments. 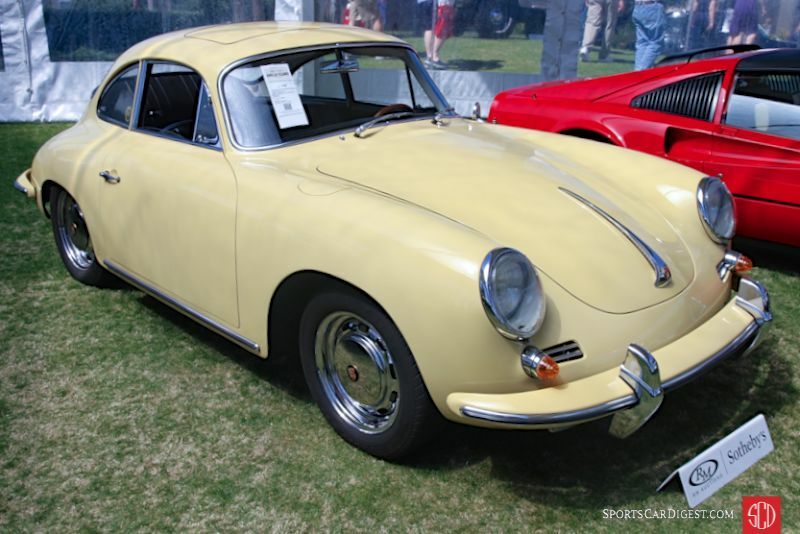 Lot # 106 1964 Porsche 356 SC Coupe, Body by Reutter; S/N 128987; Engine # 811655; Champagne Yellow/Black; Estimate $140,000 – $180,000; Older restoration, 2- condition; No Reserve; Hammered Sold at $110,000 plus commission of 10.00%; Final Price $121,000 – Steel wheels with hub caps, Dunlop tires, sunroof, Nardi woodrim steering wheel, VDO dash clock, Blaupunkt AM/FM pushbutton. – Passenger’s side door isn’t flush. Lightly cracked mirror gasket. Big gouge out of the left tailpipe. Very good, lightly worn interior. Very good paint. Beautiful car, and its few flaws are easy to overlook. Restored in 2003 and equipped with a rebuilt replacement gearbox. – This transaction is another sign of the Porsche market not being as hot as it was a year ago. In 2013, this car was sold at Mecum Houston for $93,625. Two years later, it was sold by RM in Arizona last year for $159,500. It was a no reserve lot and only the second car of the day to cross the block at the Ritz, but the difference between the last two sales is still significant in the Porsche 356 trend. 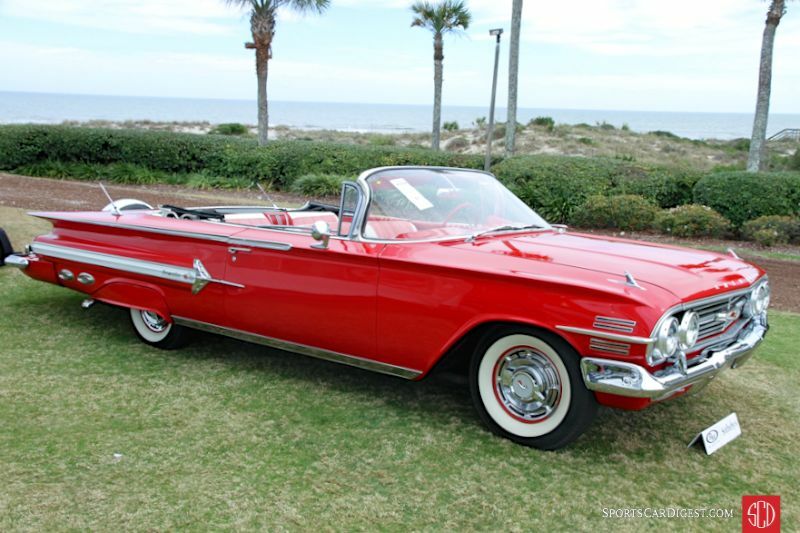 Lot # 107 1960 Chevrolet Impala Convertible; S/N 01867L189246; Roman Red, Ermine White/Red, White vinyl with houndstooth cloth inserts; White vinyl top; Estimate $40,000 – $50,000; Older restoration, 2- condition; No Reserve; Hammered Sold at $60,000 plus commission of 10.00%; Final Price $66,000 – 348/335hp, Tri-Power, Turboglide, Red steel wheels with spinner wheel covers, Remington whitewalls, dual mirrors, dual antenna, Continental kit, rear fender skirts, bench seat, column shift, power steering, power brakes, pushbutton radio, heater. – Very good older paint and chrome. Small chips at the front of the driver’s side door. Slightly dirty top. Slightly discolored white upholstery inside. Slightly dull original gauges. Lightly worn older cloth. Older looking steering wheel. Tidy, lightly used engine bay. A fun cruiser that was probably immaculate when first restored, but that was clearly some time ago. There is no representation that this driveline is how it was originally configured. – It’s not the kind of car usually seen at RM and its condition left some things to be desired, but in terms of equipment, body style and arguably color it’s the most desirable ’60 Impala of them all. It sold for well over RM’s presale estimate, but was an appropriate result for an attractive driver probably powered by a replacement drivetrain. 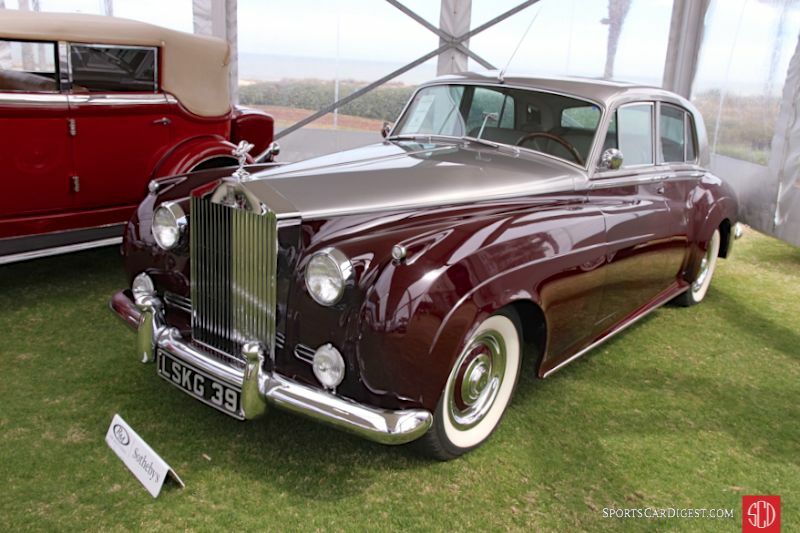 Lot # 114 1959 Rolls-Royce Silver Cloud I Sedan; S/N LSKG39; Engine # SG19; Shell Grey, Claret/Gray leather piped in Maroon; Estimate $90,000 – $120,000; Older restoration, 2 condition; No Reserve; Hammered Sold at $82,500 plus commission of 10.00%; Final Price $90,750 – Wheel covers, Silvertown whitewalls, Lucas driving lights, dual mirrors, modern custom walnut steering wheel, Radiomobile pushbutton radio, armrests, fold out tables in back, dome courtesy light, factory air conditioning, power windows. – Small crack at the bottom of the right A-pillar. Lightly cracked windshield molding. Otherwise very good repaint. Very good, barely worn interior. Good older chrome. Clean underneath. Showing a substantial 91,058 miles and wearing a 1980s restoration, this is a thoroughly presentable, usable car if not a show winner any more having had its RROC class winning days. – No one will have make excuses for this Rolls-Royce, or for the price it brought. It is an outstanding example, especially when so many of these have seen minimal care in their later years and been subjected to repaints barely better than Earl Sheib. Quality still shows, and this car has it. 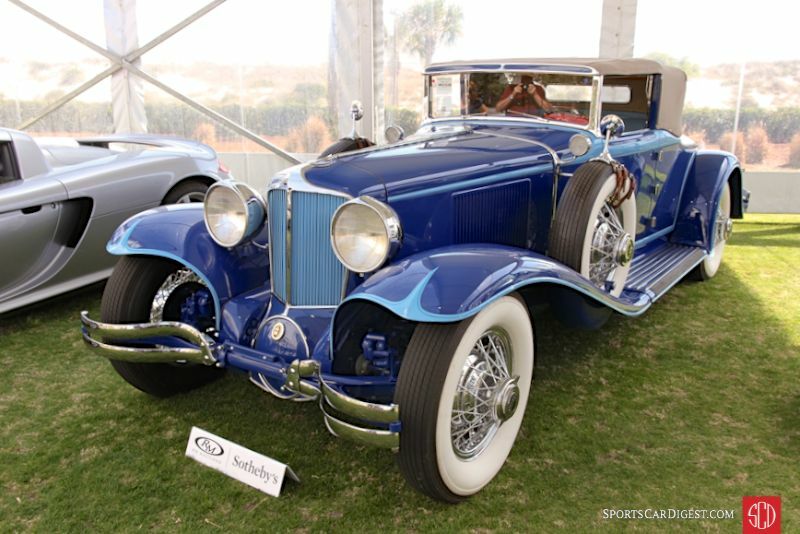 Lot # 115 1930 Cord Front Drive L-29 Cabriolet; S/N 2928140; Engine # FD3266A; Blue, Light Blue accent/Light Blue leather; Beige cloth top; Estimate $200,000 – $250,000; Older restoration, 2 condition; With Reserve; Hammered Sold at $185,000 plus commission of 10.00%; Final Price $203,500 – Chrome wire wheels, Lester wide whitewalls, Twilite headlamps, dual sidemount spares with mirrors, suicide doors, golf bag door, rear luggage rack, jump seat. – Sound older paint with a small scratch and a sizable chip on the right front fender. Slightly dirty top. Dirty exhaust tip. Small cracks in the bodywork on the tail. Very good interior. Done well and done right by marque expert Ken Clark, but done a while ago. The L-29 was one of the sleekest cars you could buy in its day, and it’s made even more eye-catching with bright two-tone colors like these. – Sold at RM Monterey in 2009 for $187,000. The careful presentation of this car during its Ken Clark restoration is the attention to original factory finishes, a car done to showroom condition, not fluffed up to beyond perfect. It is a car to be proud to own, drive and show, and with proper attention will be for many years to come. 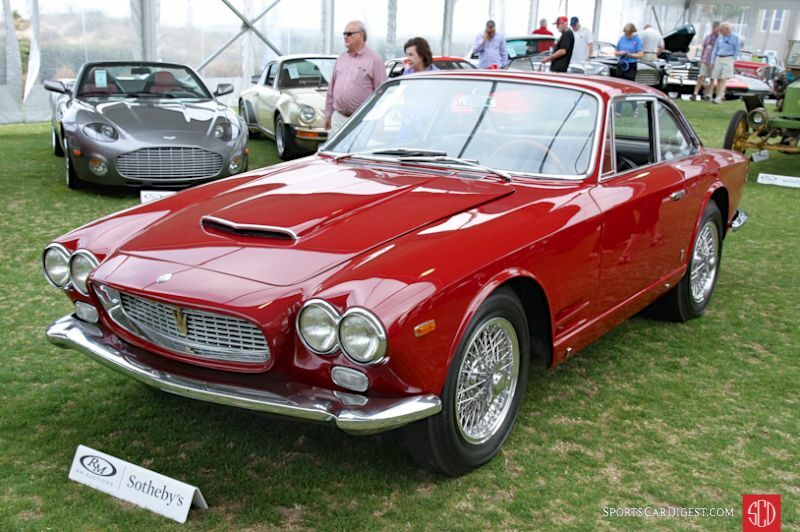 Lot # 116 1963 Maserati Sebring Coupe, Body by Vignale; S/N AM10101549; Engine # AM10101549; Amaranto Roma/Black leather; Estimate $275,000 – $350,000; Older restoration, 2- condition; With Reserve; Hammered Sold at $295,000 plus commission of 10.00%; Final Price $324,500 – 3485/235hp, Lucas injection, 5-speed, Borrani wire wheels, Michelin tires, Nardi woodrim steering wheel, Jaeger console clock, power windows, comes with a Weber carburetor setup. – Very clean engine bay. Long scratch and touched up chips on the nose. Sound older paint and chrome otherwise. Lightly worn, sound interior. A lightly used older restoration. Lightly modified by its second owner, Buick engineer Joe Lurlay, in period before being restored to original configuration in the early 2000s. – Right before its restoration, this car was hammered not sold at a high bid of $20,000 by Kruse in Scottsdale in 1999 with Webers and some body bubbles, so this massive result, which would be expensive even for a show-winning Maserati Sebring, shows just how much the market has grown in the past decade and a half. 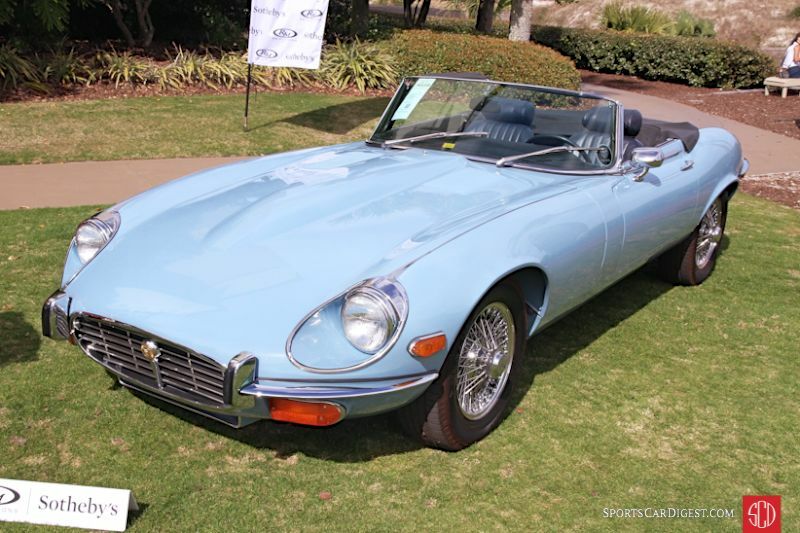 Lot # 119 1972 Jaguar XKE SIII V12 Roadster; S/N UC1S20621; Engine # 7S7424SB; Light Blue/Dark Blue; Black cloth top; Estimate $70,000 – $100,000; Enthusiast restoration, 2- condition; No Reserve; Hammered Sold at $85,000 plus commission of 10.00%; Final Price $93,500 – Centerlock chrome wire wheels, Dunlop tires, dark blue vinyl boot cover, factory pushbutton radio. – Fairly worn original seats and switchgear. Toggle switch for the choke is crooked. Wavy dash top. Excellent paint in original color and excellent chrome. Very clean underneath. Grille doesn’t quite fit flush. Has flaws and age, but they really are minor and are offset by good paint and chrome in gorgeous colors. You’ll only notice any flaws once you’re inside. – An auction veteran. Sold at Worldwide Lake Forest in 2013 for $44,000, then hammered not sold at Worldwide Montgomery in 2014 at a high bid of $54,000 and sold at Auctions America Santa Monica last year for $70,400. It’s a representative trajectory of V-12 E-Type values, with this result being slightly expensive for an example in this condition. 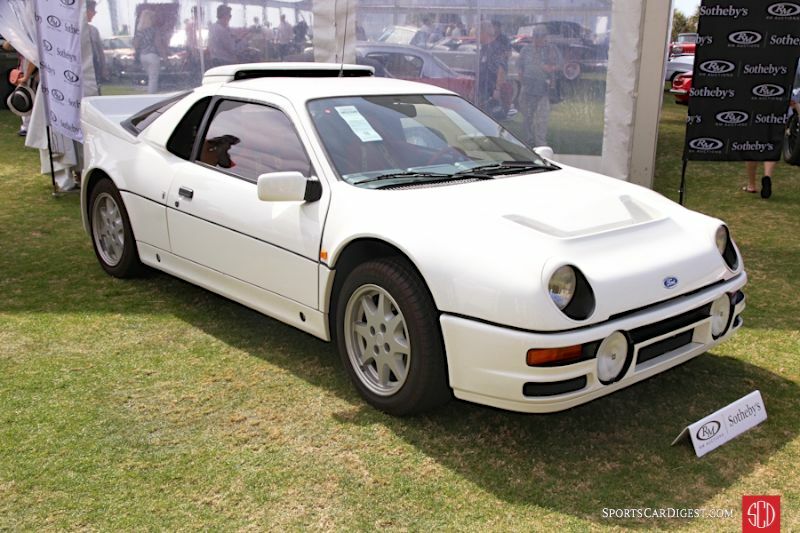 Lot # 121 1985 Ford RS200 Evolution Coupe, Body by Ghia; S/N SFACXXBJ2CGL00070; Engine # BDT0018; White/Red cloth; Estimate $500,000 – $700,000; Unrestored original, 2- condition; With Reserve; Hammered Sold at $475,000 plus commission of 10.00%; Final Price $522,500 – Speedline wheels, Pirelli P700 tires, braided steel lines, power windows, Pioneer cassette stereo, Sparco bucket seats with Sabelt harnesses, fire extinguisher. – Cleaned up engine bay. Big touched up chip and a few stress cracks on the nose. Slightly dirty wheels. Very clean interior. Showing 461 miles, but not quite like new. – The RS200 was the world’s fastest accelerating production automobile when it was new, and the Evolution, of which only 24 were built, had a larger 2.1-liter engine and upgraded suspension and brakes. Setting a value on a rare version of an already rare rally homologation special isn’t always straightforward, but Gooding sold another very good RS200 Evolution in Pebble Beach last year for $539,000, so it’s probably safe to call half a million dollars the going rate. 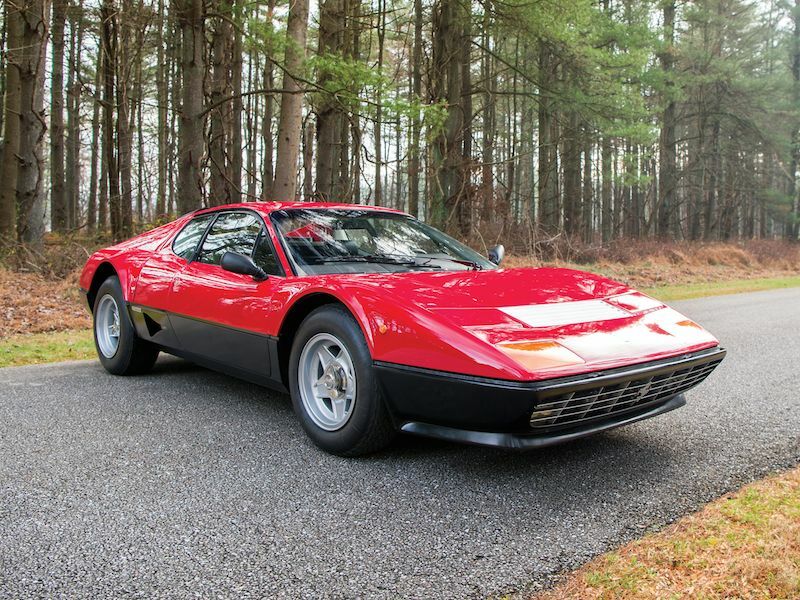 Lot # 123 1980 Ferrari 512 BB Berlinetta, Body by Pininfarina; S/N 33715; Engine # 729; Rosso Corsa, Black sills/Black leather; Estimate $275,000 – $325,000; Visually maintained, largely original, 3+ condition; With Reserve; Hammered Sold at $270,000 plus commission of 10.00%; Final Price $297,000 – Quadruple triple-choke Webers, Cromodora centerlock wheels, Michelin tires, Nardi leather-wrapped steering wheel, power windows, Borletti air conditioning, Pioneer cassette stereo, EPA letter. – Light curb rash on all but the right front wheel. Decent single repaint. Large touched up chip on the nose and another sizable bare one above it. Crack between hood vent and headlight door. Cracks behind the right window. Chips on engine cover vents. Worn but sound upholstery. Federalized in New Jersey in 1980. Last reported major service in 2007. A mostly original 44,797-mile car showing its age, but not badly so. – Bought modestly for a Berlinetta Boxer, but even as well maintained and looked after as it is having not been fully serviced since 2007 it will head straight for a Ferrari shop where low five-figures will be added to its acquisition cost to bring its maintenance up to date, and possibly more depending on what the shop finds. It is a reasonable risk at this price but at any more it gets into crapshoot territory.